Apple has confirmed it will be shipping the update to watchOS 5.1.2 on Thursday complete with support for the Apple Watch Series 4's electrocardiogram (ECG) measuring function, a feature that was notably absent at the device's launch. Arriving later today, the update will include the ECG app, which will work just on the Apple Watch Series 4, the company advised. While the current watchOS 5.1.1 does not currently support the function, the release of the in-beta watchOS 5.1.2 will bring the feature live to users based in the United States. Touted as a major feature for Series 4 models, the function marks the first time an ECG device has been made available over the counter to consumers. At the time of launch, Apple advised the function would not be available immediately, but would be enabled in a later software update. The app is capable of using new electrodes in the back crystal and Digital Crown to take a single-lead reading. To take a reading, users must open the ECG app and hold their finger on the crown for 30 seconds, after which the readings are classified as atrial fibrillation (Afib,) sinus rhythm, or inconclusive. I'm so proud of all the teams that worked very hard to make this happen! Recordings and classifications, as well as any noted symptoms, are stored in the Health app on the connected iPhone, which can be shared with physicians at a later time. Owners of earlier Apple Watch models as far back as the Series 1 will be able to benefit from another addition to watchOS. Using the optical heart sensor, the Irregular Rhythm Notification feature will check a user's heart rhythm in the background for signs of irregularity that may be Afib. If the Apple Watch detects irregular rhythms on five checks over a minimum of 65 minutes, it will warn the user of the potential health problem, and to gain further advice from a physician. Left untreated, Afib is said to be one of the leading conditions that can result in a stroke, the second-most common cause of death in the world. According to CDC estimates, Afib can affect up to two percent of the younger population of the United States, rising to nine percent for those 65 years or older. 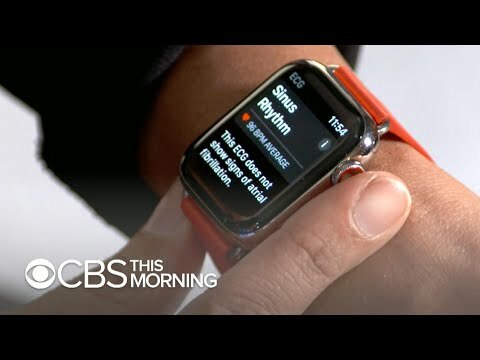 In a CBS interview aired on Thursday, Apple COO Jeff Williams said that the ECG feature came about organically as the company received more and more feedback from Watch owners saying that heart rate alerts had saved their lives. He also downplayed the issue of false alarms, arguing that while they will happen, "the impact on the other side far outweighs that." Yeah!!! Can't wait to test this out! This was perhaps the most compelling reason I upgraded my Series 2 to a Series 4, and got one for my wife. When you start closing in on 60, things that were never a thought are suddenly very serious possibilities. I would never have imagined my wife would have had a stroke at 57, but she did. Now she's about 90% recovered, but her sense of balance is not as good, nor can she do other cognitive things as fast. So, what is a novelty to others - is a very serious consideration for many. I'm glad to see this welcome addition to the Health coverage that is presently on our Apple devices. Well, all I can say is that I hope you and your wife never need it. I upgraded from Series 0 to 4 for this. I had two close friends keel over from heart attacks in their early 40s. Nip it in the bud! Same - upgraded from Series 0 to Nike+ Series 4. My Series 0 was practically unusable at this point aside from telling time. Everything was so SLOW. Amazing the improvement over the last few iterations and really like the Series 4's larger screen!! Looking forward too ther countries to come, in particular Germany, since I’m living there. 10:56 EST and my iPhone X still reports watchOS 5.1.1 is "up to date." I can’t tell from the article, but is this a regular update today, or a beta update for developers. It wasn’t clear. At one point they mentioned it as a beta. I’m on 5.1.1 with the Series 4, and am up to date as of about 5 minutes ago. So unless it is a beta, it’s not actually out yet. I believe that Apple will release the WatchOS around 10am PST, which is still a couple hours away. Look for it around 1pm your time. I'd already done that and should have said so, but thanks. It's now 12:14 p.m. EST and still no update available for the watch. I won't be a bit surprised if you are correct. Started downloading at 1:12 p.m. EST. AFAICT Apple has not explained the rationale, particularly the odd age of 22. Also, and I'm sure most everyone is aware of this, it cannot detect either strokes or heart attacks. The FDA apparently told Apple to do that. I’m not sure of why. Possibly there isn’t enough studies to show whether it makes a difference at that age.